WEST PALM BEACH, Fla. – The Leukemia & Lymphoma Society honored more than 60 volunteers for their time and talent in presenting a host of events over the past year. Volunteers were integral to the Light The Night Walks, Team In Training, Black Tie Gala, Man & Woman of the Year, and School and Youth campaigns. Among the honorees at the celebration, held June 26, 2014, at the Wine Dive in West Palm Beach, were blood cancer survivors who volunteer their time to help other patients and to further the mission of LLS. Patrick Quinlan, chairman of the Board of Trustees, welcomed the crowd and provided highlights from the past year. “Thanks to the dedication and hard work of our volunteers, we have not only surpassed our annual financial goals, but have also contributed to some important objectives in advocating for the rights of all cancer patients in Florida,” Quinlan said. 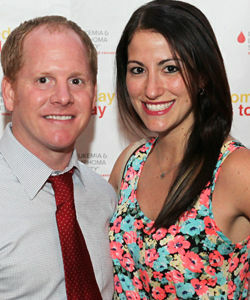 The Palm Beach Area Chapter of The Leukemia & Lymphoma Society covers eight nearby counties. LLS is the world’s largest voluntary health organization dedicated to funding blood cancer research and providing education and patient services. For more information, call (561) 616-8682 or visit www.lls.org/pb. Photo by Bob Dobens Photography.